Wedding bells are ringing for Mickey and Minnie Mouse! Beautiful, colorful statue stands about 7 3/4-inches tall. This makes a much-appreciated wedding gift. Mickey and Minnie Mouse celebrate one of life's most cherished moments, and they will be happy to honor yours or that very special day for someone you know. 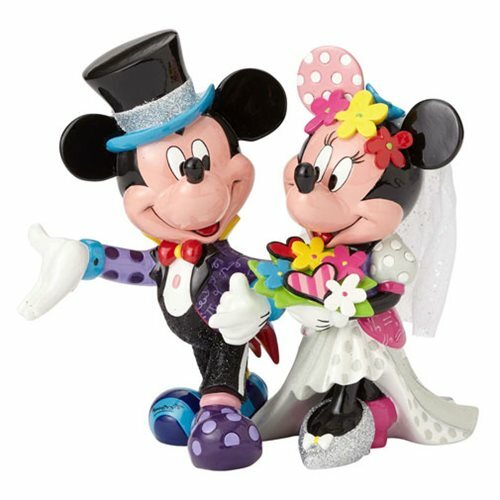 This magical Disney Mickey Mouse and Minnie Mouse Wedding Statue by Romero Britto also makes a wonderful memento for years to come. Designed by pop artist Romero Britto, the beautiful, colorful sculpture is made of stone resin and measures approximately 8 3/4-inches wide x 7 3/4-inches tall x 6 1/4-inches long.